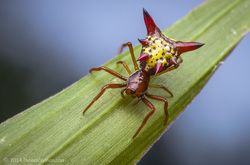 Arrow-Shaped Micrathena are brightly colored spiders, with spikes on their abdomen that resemble an arrowhead. These spiders spin spiral webs in gardens or woodlands. They feed on common outdoor insects that get caught in their orb-shaped webs. They are rarely seen indoors and their venom is not seen as dangerous to humans. Click here to learn about the Barn Spider!